I created a new document in Inkscape that was 3″ x 3″, created a circle using the ellipse tool and centered it within the document using the Align & Distribute tool, and kept layering artwork into it. 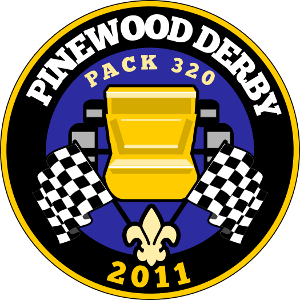 I got the artwork for the flags and the fleur de lis from Open Clip Art, and I drew the derby car using pinewood derby car photo references I found via search. I rotated the text around the circle using the “Put on Path” tool under Inkscape’s text menu. To keep creating circles within circles that are perfectly centered, the trick I used was to Ctrl+D the outermost circle and hold down shift while I scaled the circle down – this scales from the center of the circle rather than from the point you’re dragging the scale edge from. The “Pack 320” text looks a little flat compared to the circle containing it, but that might just be me. Looks great, though. Fantastic work. I was a Cub Scout myself decades ago and would have really been excited if free software had been around at the time. 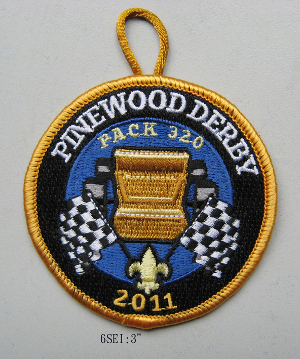 And would have loved a patch life this for our Pinewood Derby races! Wow, never thought Inskape could do that. BTW, what comment system are you using?